Mary (Snail) – From SpongePedia, the biggest SpongeBob-wiki in the world! 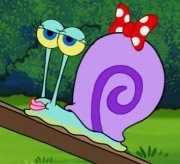 Mary the Snail is a snail featured in the episode Gary in Love. She looks quite similar to Mrs. Puff's Snail and Snellie. She is quite posh. Her owner is Monica.